Two balls collide. The diagram below shows the initial and final velocities of the balls. 5.Select any of the comments below that are correct (there may be more than one correct answer). a. Ball 1 and ball 2 experience identical forces. b. The forces experienced by ball 1 and ball 2 have the same magnitude. 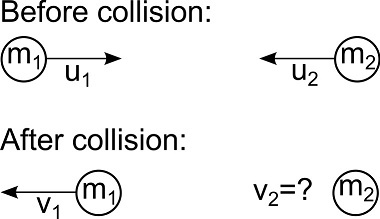 c. Momentum is conserved so this is an elastic collision. d. Kinetic energy is not conserved in this collision so this is an inelastic collision. e. Kinetic energy is conserved in this collision so the collision is elastic.